Here’s a good prayer idea that offers a solution of how to individually cover large amounts of specific prayer requests from individuals in large group gatherings through the use of prayer request cards. Many Christian groups like to give members the opportunity to have a personal prayer request covered in prayer, but praying out loud individually with a large group over every need in church services or other large Christian ministry gatherings would take too much time. If groups use written prayer requests from the whole group and collect them for later prayer, it creates a very large prayer task for individuals or a small group of volunteer intercessors to pray over a mountain of requests after the meeting. 1. Pass out prayer request cards. 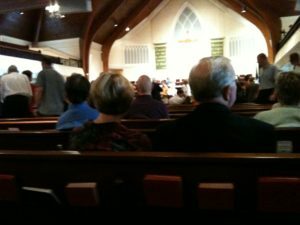 The gathering I attended was like worship service held in a church sanctuary with about 150 people present. Early in the meeting the leader announced that helpers would be passing out index cards to everyone on which they could write a personal prayer request. Attendees were asked to raise their hands if they needed a card and the helpers who had handed out programs handed out cards to those who requested them. An alternative way to provide prayer request cards to attendees is to insert them into the bulletin or to have them available on the seats or in card holders in the pew racks. 2. Foster a sense of a praying community. 3. Collect the cards and distribute them along the altar rail. The leader then asked the helpers who handed out the cards to collect them. After collecting the cards, the helpers distributed them along the kneeling pads of the altar area. 4. Instruct and encourage each attendee to pick up a card and pray. The leader then asked individuals in the group to pick up one prayer request card when they knelt at the altar rail area during communion. Members were encouraged to take the card, pray for the person while at the altar, then take the card home for further prayer. In this way, each individual request was covered in more depth by a greater number of people, one or two intercessors weren’t left with a large amount of requests to cover, and the worship time was not taken up with trying to cover a large amount of specific prayer requests. If your group is not taking communion or if members are not accustomed to praying at the altar rail during your gathering, you can use an alternative means of distributing the prayer requests to those in attendance. Ideas include passing a basket back through the group and have everyone take a written request or having the filled-out request cards available by the doorway in a receptacle where people may take them as they leave or having an usher with a basket at the doors who hand requests to members as they leave. I personally like a method that actually puts the requests in member’s hands at a prayerful time during the group meeting when everyone can immediately silently pray for the request as a corporate act of care and prayer while the individuals who made the request are still gathered with the group. It also lends itself to being able to speak to someone who might have signed their name to a request after the meeting to let them know that you will continue to be in prayer for them.